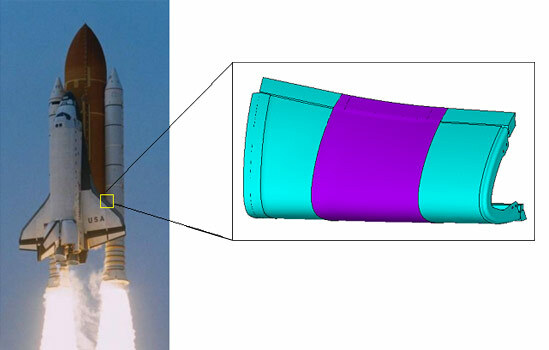 » Space Shuttle Thermal Protection Systems (TPS) Materials Research & Design, Inc. Since the Columbia Space Shuttle tragedy, MR&D has been significantly involved with analysis and design, fabrication and testing efforts associated with refractory composite materials and structures designs for the thermal protection system repairs of the NASA Space Shuttle. MR&D has been involved with numerous repair projects involving both the reinforced carbon-carbon (RCC) wing leading edges (WLE) and the TPS tiles attached to the lower acreage region surface of the Space Shuttle. Illustrations of some of these RCC TPS repair concepts are provided in the images below. Illustration of proposed CVI C/SiC rigid overwrap repair concept for Space Shuttle RCC WLE’s. Illustration of CVI C/SiC flexible plug repair design for Space Shuttle RCC WLE’s. MR&D’s most recent efforts in RCC WLE TPS repair have been in assessing margins of safety for the TZM attach hardware during the re-entry event and is assessing the survivability of the CVI C/SiC plugs from the high aerodynamic pressure and shear forces following the high heating loads, just prior to landing of the Space Shuttle. MR&D’s role in the RCC WLE coating crack repair effort has been to generate and calibrate mathematical models simulating the performance of the ATK Ceramics/NASA MSFC NOAX-D coating crack repair material on re-entry of the space shuttle orbiter. on RCC plate in bay of the Space Shuttle during STS-121 mission. The ultimate goal of this math model development program is to develop a real-time emergency repair assessment tool, capable of predicting the performance of the NOAX-D coating crack repair material for an actual RCC WLE coating damage, for a real re-entry of the Space Shuttle. devised by ATK Ceramics with the participation of NASA Marshall Space Flight Center. 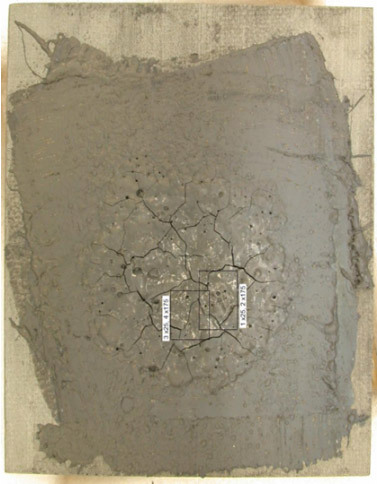 Example of MR&D coating crack repair model failure plot. MR&D has also been involved in the repair efforts for the Space Shuttle tiles covering the lower surface windward acreage regions of the orbiter. Support to NASA and USA on the GFE Tile Overlay Repair project. 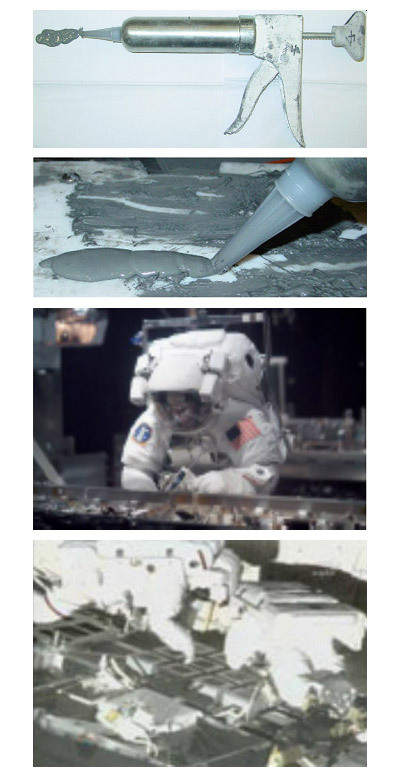 In conjunction with the NASA/USA GRE Tile Overlay Repair project, the MR&D support has involved the recommendation of material property testing and the calculation of “A-basis like” design properties for the CVI C/SiC materials used for the tile overlay repair. 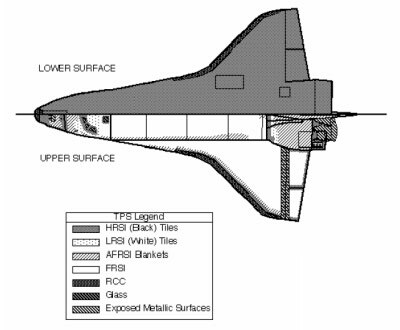 MR&D has also assessed design margins of safety for CVI C/SiC panels flexed over simulated damage areas of single and double curvature regions representative of the lower windward surface acreage region of the Space Shuttle. MR&D has been recognized by NASA for their excellent contributions to the TPS repair efforts for the Space Shuttle. We have received a /One NASA Peer Award/ for our work on repair of the Space Shuttle Reinforced Carbon-Carbon composites. MR&D is also a member of the NASA Thermal Protection System (TPS) Tile Repair and Reinforced Carbon-Carbon (RCC) Repair Teams, which were selected to receive the American Institute for Aeronautics and Astronautics 2007 Space Operations and Support Award. This award nationally recognizes the Repair Teams for exceptional performance in developing the hardware and techniques necessary for Shuttle TPS contingency repair. MR&D has also been included in the list of inventors for a U.S. Patent application entitled “Flexible Plug Repair for Shuttle Wing Leading Edge” being prepared by NASA Langley Research Center.